Julena is a home baker on a mission. Having got her love of baking as a young girl with her Croatian mama, she has developed her skills, recipes and ideas over the subsequent years. A push to get herself, and her family healthier and feel better, found her researching diets and nutritious whole foods, Paleo and cutting dairy out. Inevitably, these ideas soon found their way into her baking. 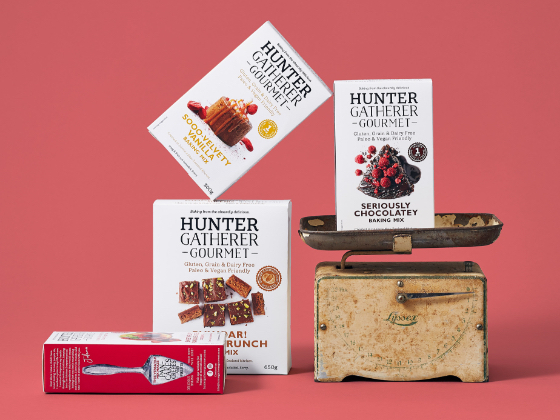 It was through her trials, tests and samples with various ingredients that the idea of Hunter Gatherer Gourmet was born. All people need cake, no matter what your health or lifestyle choices are. 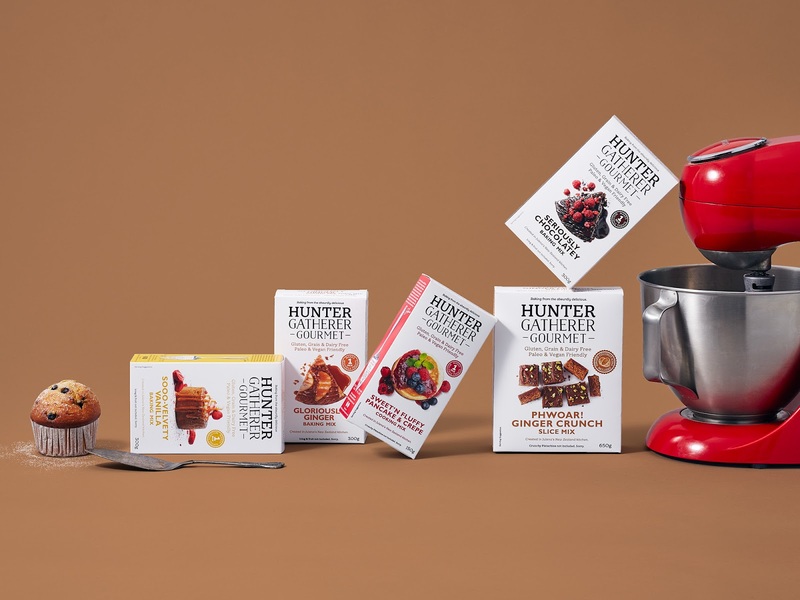 As a tight-knit, premium range of easy to use baking mixes which were free from…everything, the brand was unique in the supermarket aisle. 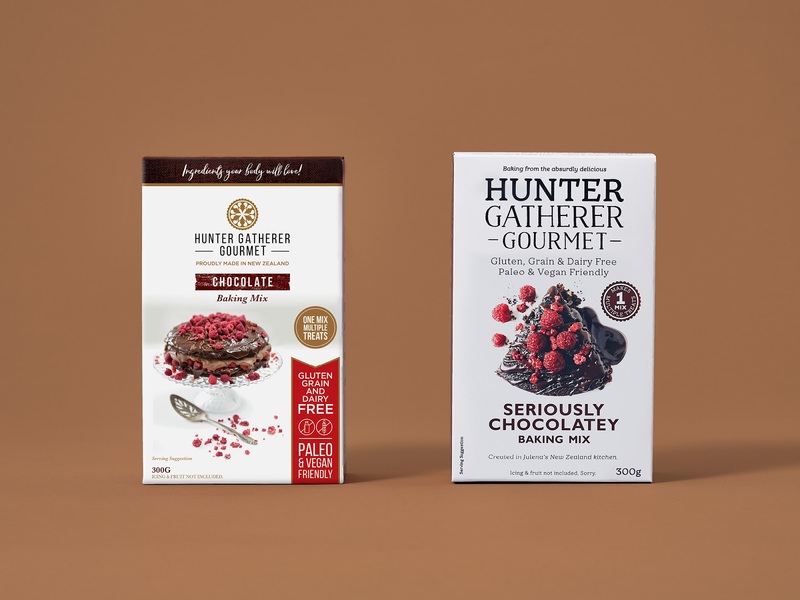 But the ‘me-too’ packaging limited shelf appeal amongst the bigger and more recognisable everyday brands, following a design formula to ‘fit in, not stand out'. Along with a premium price point, the brand needed to challenge the status quo. 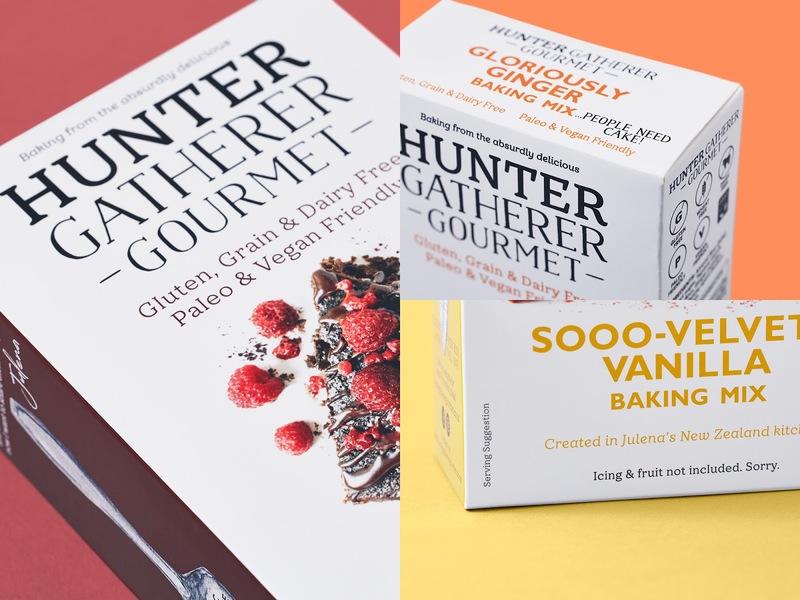 Taking inspiration from the boutique, artisan food producers who frequent delis, patisseries and emporiums we reworked the brand and packaging to stand out by doing less. 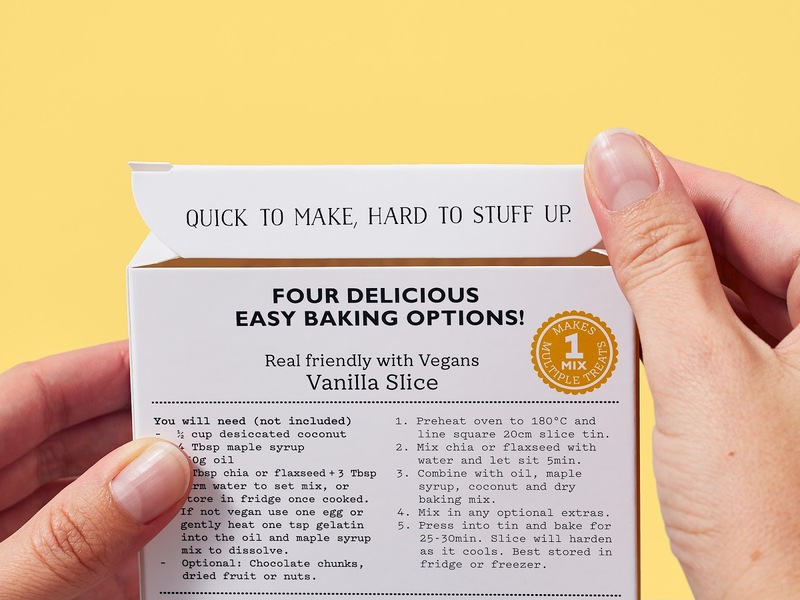 Redeveloping the brand mark to capture Julena's quirky approach to baking, and simplifying messaging across packs to highlight the ‘free-from’ premise creating a strong premium aesthetic. A white pack was a brave but considered move. 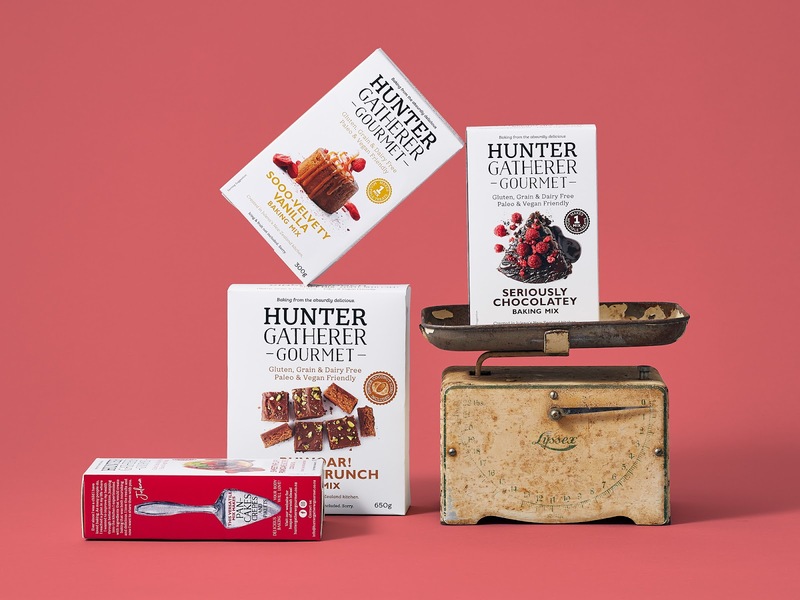 While all other brands in the segment are bright and colourful, the white background of Hunter Gatherer helps amplify the yum food photography and pops of colour stands out on shelf in this busy environment. 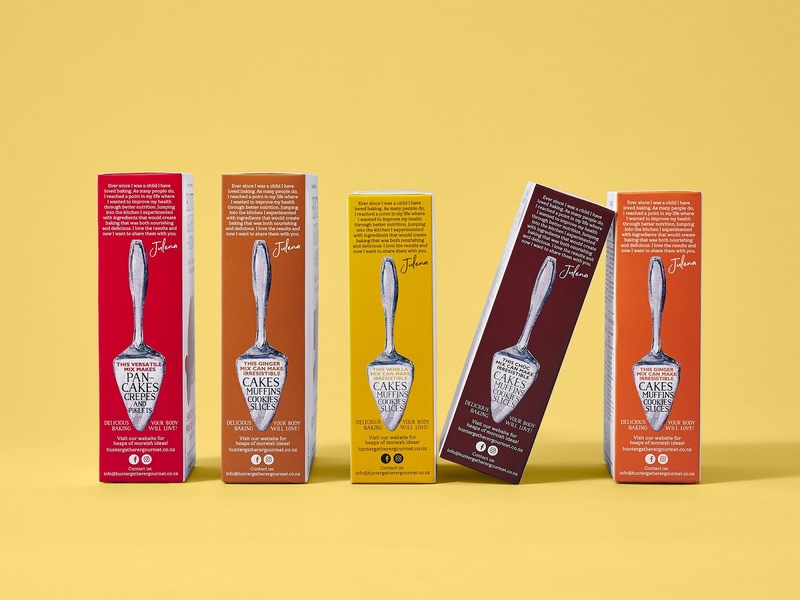 Messaging and callouts that were previously hidden on pack or were lifted from social media posts were given more prominence on packs to bring character, warmth and delight as the box is read and opened. This brings Julena’s mission of ‘People need cake’ full circle with a brand that demands attention from the avid baking enthusiast and challenges the idea that being ‘free from’ means lacking taste.